For lo these many years I've learnt to do a lot of my artwork digitally. Just about anything you see on my blog that involves color was done with Photoshop, Painter or Illustrator. I enjoy working digitally, but I've been having a hankering lately to produce art that exists in the real world. Part of it has to do with some musings on the awesomeness of paper I've been having lately (I topic for a post in the not too distant future), but it also has to do with the trend pointed out by Merlin Mann that no matter what your profession is nowadays, you probably do it on a computer. Now, if I was computer programmer, I wouldn't have much of a choice (unless I wanted to dictate code for later transcription or write it out in long-hand). But as an artist, its well within my ability to unshackle myself from the computer and work with something made out of atoms. Ironically, I find that when I am working in the atomic medium, I am much less prone to exhaustion, eye-strain, and compulsive email checking. So, while I'm no Scott Campbell or Bill Pressing, there are nonetheless, some things I like about this doodle, and some things I like about working with watercolor in general. First off, its terrifying. I used to get sweaty palms when I first started trying to ink my own stuff, but even with inking I can at least use correction fluid to clean up my stuff. With watercolor, what I put down, stays down. I like this. I like that it makes me approach my work methodically and analytically. I spend more time visualizing what I'm going to do and breaking down the process. Regardless of the medium this is a very good thing to do. I also allows the process to be more alive. It becomes more like a performance art. I'm not noodling details, but rather the art is created in a singular, non-reproducible moment. 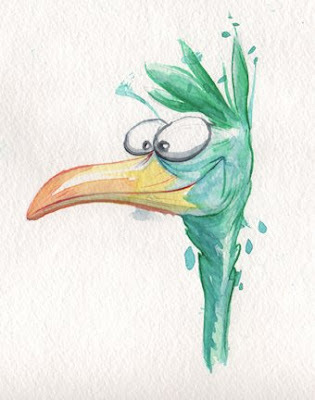 Second, I love the texture of watercolor. For all the fancy "watercolor" brushes I've seen the in various digital painting programs out there, nothing feels and looks like watercolor. Lastly, I like that when I'm done I've got something I can hang on my wall without. I can always print out digital art, but the print is never the actual art. It's just a copy. As promised I'll get into more about the awesomeness of paper in a later post. Stay tuned this week for more Green Monk updates!